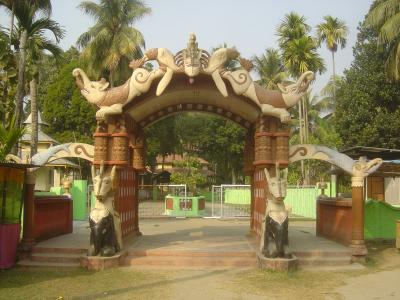 Bordowa satra which is the birthplace of the the great artist, literateur, dramatist and the founder of Vaisnavism in Assam, a Shrine and a centre of Vaishnava art and culture. It is about 140 kms. from Guwahati and about 18 km North – West from Nagaon town. There are two Sattras : Narowa Sattra and Salaguri Sattra. A mini Museum is located in Narowa Sattra and the birth and death anniversaries of the Vaishnava saints are observed there with great grandeur. Bordowa satra is one of the best known Satras founded by great Sankardeva. After returning from his first pilgrimage in about 1494 A.D. Sankardeva founded the first Namghar or Kirtanghar at Bordowa to practise and preach his newly founded faith in Bhagawata and Puran Sastras. At the time of Sankardeva the word 'Satra' was not used. Sankardeva himself used the the word 'Dham' or 'Thaan'. So Batadraba is the first institution for propagation of EK SARAN NAM DHARMA. Sankardeva also built the 'Monikut' together with Namghar and the 'Cari-Hati' for accommodation of his disciples at the Thaan. Simhasana or Thapana (altar of God) was placed in the Monikut with Bhagawata Sastra on it without any idols. Sankardeva used to practice Nam Prasanga regularly in the Kirtanghar along with his followers and Bhaktas. His religion was very simple. There was no useless ritual at his time as has been in many places under the wings of 'Bamacari Budhism', Tantricism etc. Sankardeva advocated 'EK DEVA, EK SEBA, EK BINEY NAHI KEWA'- that one should worship none but one God, who is Lord Krishna. Most of the priestly classes in the society were the votaries of Saivism and Saktism and they propounded sacrifice of birds, animals and even man. Sankardeva discarded all forms of violence including sacrificial rituals before the altar of Gods or Goddesses . Batadraba was the centre of his core ethical values and spiritual realization. As such, Batadraba has been regarded as the Dwitiya Vaikuntha (second heaven) and even greater than Dwaraka or Vaikuntha itself. By rail: Haiborgaon Nearest Railway Junction is at Chaparmukh which is around 28 km from Nagaon Town. By road: Nagaon is well connected by road links. The National Highway No. 36 and No. 37 provide easy access to important places of Nagaon District.